Welcome to another week of Travel Photo Thursday I’ve been in Halifax for a week and a half, and the weather has not been all that fantastic. I’m spending most of my time with my Dad, but did manage to get away for two days. We even ended up with one day of beach weather! This shot was taken at Rushton Beach in Marshville, Nova Scotia. This is along the Northumberland Strait, which runs between Nova Scotia and Prince Edward Island. The water here is warm because of the Gulf Stream. 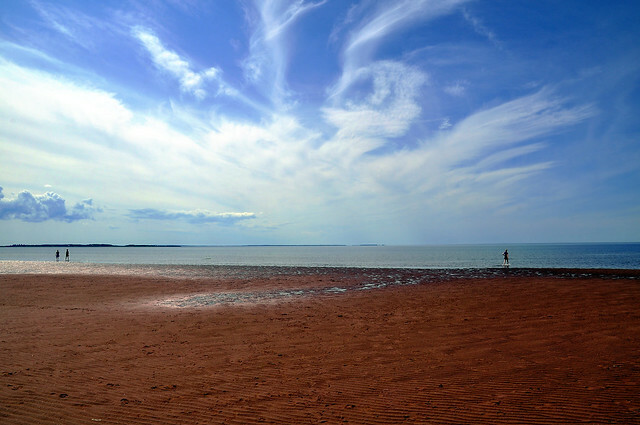 You’ll also notice that the sand is reddish, which is a characteristic of Prince Edward Island Beaches. If you go to beaches on the other side of Nova Scotia they are white sand. I really like how the clouds seem to swirl to make a focal point for the image. I never knew there was warm water anywhere in Canada! I had no idea that the sand was reddish on PEI beaches and I’m Canadian. I really need to explore the east coast. Switzerland is filled with wonderful lakes, but they are just not seas or oceans…I am an island girl after all. Great clouds! Welcome back to Canada! It sounds like the weather has been pretty meh right across the country so far. I never thought there are such beaches in Nova Scotia. Yep, looks like PE Island. Gorgeous! Is this near Pictou? Another great picture of a beach! Lovely. Looks like a great place for a nice walk. Love the colour of the sand! Looks like a great day on the beach. I hear it’s been unseasonably cold so wonder how the water is for swimming.Hope you’re loving your Nova Scotia vacation. Such a beautiful shot, Nancie! I love the red color of the sand and its texture! What a beautiful place and fantastic shot! I was in Nova Scotia as a teenager and have thought about it many times since. I guess it’s time to get back there. Love the photo – nice contrast between the bright blue sky and the red soil. I was completely mesmerized by the red soil when I visited PEI a few years back. Didn’t know the beaches in Nova Scotia had red in them too. I love beaches, anywhere but, was just a surprised as the rest about having warm water up in Canada. Hurry back to Korea. I can’t seem to get used to the Canadian daze of the week and am always late getting my entry in to you for TPThursday! Must be really great to get away back home again, and spend time with family, Nancie. And with wide open spaces as shown in this beach shot, what could be better for a change of scenery from your usual routine back in Korea. All the best for the rest of your stay. I have always, always wanted to go to Nova Scotia. Look at that sky! I will make it there some day, definitely. I think I’d like to house sit there, so I could stay a long while. I know I’m biased because it’s my home. That being said, Nova Scotia really is a special part of the world. I do hope you get to spend some time there one of these days. WoW! The sky really makes this photo distinct in my mind.